Angraecum sesquipedale, also called the Christmas Orchid, Darwin's Orchid, King of the Angraecums, or Star of Bethlehem Orchid, is the most magnificent of all Angraecum species. It's accumulated so many common names for a reason: people pay attention to them, as the flowers are quite dramatic. The Latin name "sesquipedale" means "a foot and a half", and refers to the length of the flower's nectar-containing spur. Charles Darwin famously anticipated the existence of a moth with a proboscis long enough reach the bottom of the flower's nectary. The predicted moth was later discovered in 1903; it is the hawk moth Xanthopan morganii praedicta. 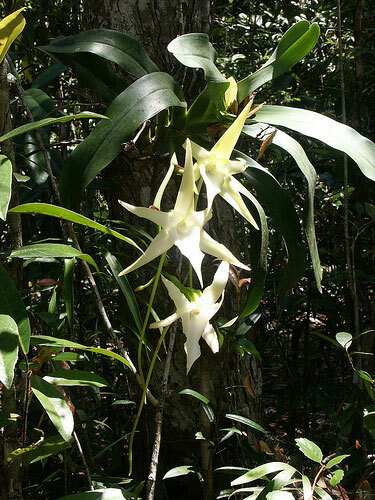 They usually bloom in midwinter when cultivated in the northern hemisphere (hence the "Christmas Orchid" moniker,) and the white, waxy flowers are fragrant at night, to attract its nocturnal pollinator. Individual flowers can last a couple of months. They originate at low elevations in Madagascar. They typically grow as epiphytes on the most-exposed parts of tree trunks, on trees at the fringe of forests; in cultivation, this means they want to dry out quickly and receive plenty of breeze, such as from a fan. They also get frequent rainfall in nature, so in cultivation, water frequently. You'll probably want to either mount them on a slab of bark or grow them in a coarse potting mix such as large pieces of fir bark, so they can dry rapidly; then water often, such as daily. These plants can get quite large; roughly 3 feet high is typical (about a meter, for you metric folks! ), and leaves are roughly a foot long (30cm). The tips of the leaves are rounded, or may have a lobe on each side of the central crease. They have few roots, but they tend to be quite thick, and grip the supporting tree bark quite strongly. They hate to have their roots disturbed, so repot these orchids infrequently, or ideally never. Using a very coarse potting mix, if growing it in a pot, can help reduce the frequency of repotting, as can making sure the pot is large enough for the plant's mature size. (They grow monopodially, so if the pot is big enough it will never be outgrown.) If you must repot it, give it a couple of weeks without water so the roots can heal before getting wet. They like intermediate to high light, 2000-3000 footcandles or a bit higher. Cattleya light usually works well, but you might have to go a bit less if there's sunburn. Phalaenopsis light is not enough. Plants of Angraecum sesquipedale grow slowly, but over time blooms become more and more dramatic. Temperatures should be intermediate to high, 70-80°F (21-27C), cooling by 10-15°F (6-8C) at night.